In 1565 the French Monsignor Matteo Contarelli acquired a chapel in San Luigi dei Francesi in Rome, but when he died twenty years later it had not yet been decorated. The executor of his will, Virgilio Crescenzi, and later his son, Giacomo, undertook the task. The decorative scheme called for a statue of St Matthew and the Angel, commissioned first to Gerolamo Muziano, and then to the Flemish sculptor Cobaert, for the high altar; and for a fresco cycle for the walls and ceiling by Cavalier d’Arpino. The latter decorated the wall in 1591-93, but the walls were left bare (this may reflect at least in part the Crescenzis’ intentions to speculate on the interest on the Contarelli estate). On 13 June 1599 a contract was stipulated before a notary by which Caravaggio undertook to execute two paintings for the lateral walls, for which he was paid the following year (1600), after the paintings had been set in place. Later, on 7 February 1602, after Cobaert’s statue had been judged unsatisfactory, an altarpiece was entrusted to Caravaggio in a separate contract that called for delivery of the work by 32 May, the Feast of the Pentecost. This painting was rejected, the artist made another one (which was accepted) in a surprisingly brief time, receiving payment for this second work on 22 September. 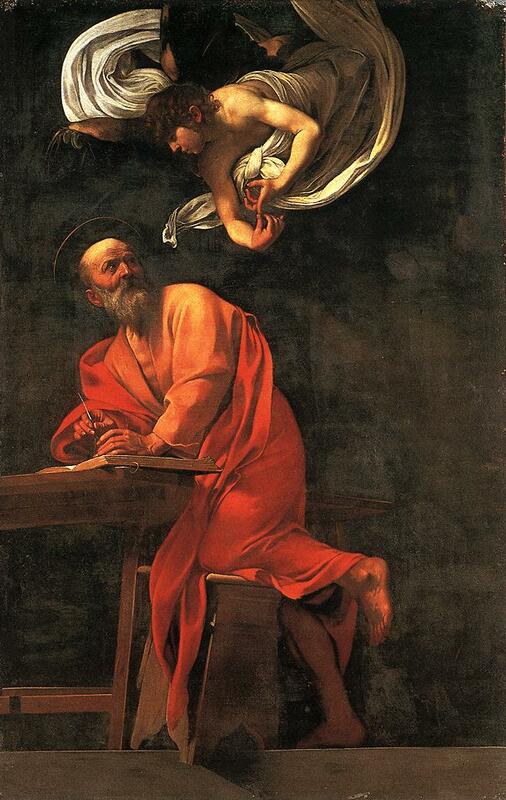 The first version of the St Matthew and the Angel was purchased by Marchese Vincenzo Giustiniani and then ended up in Berlin, where it was destroyed in the Second World War. The second version (this picture) still stands over the altar today. The first version was a masterpiece of the artist. It contained, in the angel who with gentle indulgence guided the saint’s uncertain hand as he wrote, one of the most charming figures ever painted by the artist. The first painting was criticised for Matthew’s lack of decorum. In the final version, likewise a splendid feat of imagination but certainly less fascinating than the first, the angel much more correctly counts on his fingers, in the traditional scholastic fashion, the arguments than the saint should take note of and develop. A whirlwind of drapery envelops the angel. The saint balances on his bench, in precarious equilibrium, like a modern schoolboy; but this time the unorthodox elements do not seem to have raised particular objections.